Film Soundtrack, 2001 (Hybrid) (4 / 5) Here is one of those very rare instances in which the film improves on the stage original, as evidenced by this soundtrack album. 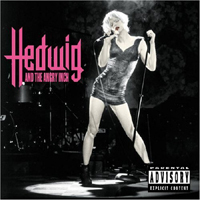 The Hedwig song list is slightly altered and rearranged, but all the good stuff is here, and the lyrics are far more intelligible than on the original cast recording. 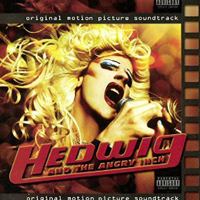 John Cameron Mitchell’s vocals are, if anything, more confident, and the overall sound mix is more balanced. The album preserves the score’s scalding cynicism and dark romanticism, its Brecht-meets-power-rock sensibility. “Wig in a Box,” in which Hedwig recalls his/her trailer-trash life in Kansas, is given an especially ebullient rendition. Listeners are reminded that this is the most original musical theater score in years, a tribute to survivors everywhere. — D.B. 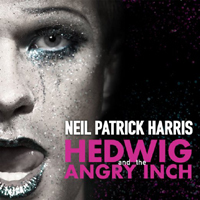 Original Broadway Cast, 2014 (Atlantic Records) (5 / 5) Dare I ask, does Neil Patrick Harris surpass John Cameron Mitchell in the role of Hedwig? (I fear angry fans hunting me down with sharp instruments.) True, Harris lacks a certain world-weary Teutonic quality that was Mitchell’s hallmark, but he sings with a purity of tone rarely heard in rock music, and he imbues the character with a powerful note of longing that helps explain Hedwig’s history of bad decisions. At times, Harris’s Hedwig almost sounds like a choir boy, which has the effect of making his tortured life story all the more affecting. And, of course, he’s a riot, finding sly humor in all sorts of places. (“What’s an eight-track?” he wonders while leading the audience sing-along in “Wig in a Box.”) By any standard, it’s a sensational performance. The tune stack is close to that of the Off Broadway cast album, but there are some intriguing differences. For example, “Sugar Daddy,” which originally had a kind of rockabilly arrangement, is given a much harder-rocking sound here. Also, the album opens with Itzhak’s introduction (“Ladies and gentleman, whether you like it or not – Hedwig!”) followed by the most electric version of “The Star-Spangled Banner” since Jimi Hendrix at Woodstock. Lena Hall’s Itzhak is given an expansive showcase, especially in “The Long Grift,” which is now her solo. She also features in the production’s most uproarious invention: Audiences on Broadway were told that Hedwig, unable to raise the funds for a full production, was performing on the set of the Belasco Theatre’s previous (fictional) tenant. This cues Itzhak’s rendition of “When Love Explodes” (Love Theme from Hurt Locker: The Musical). The bit it is as outrageous as it sounds, and it’s a highlight of this recording, which is arguably the definitive one. — D.B.